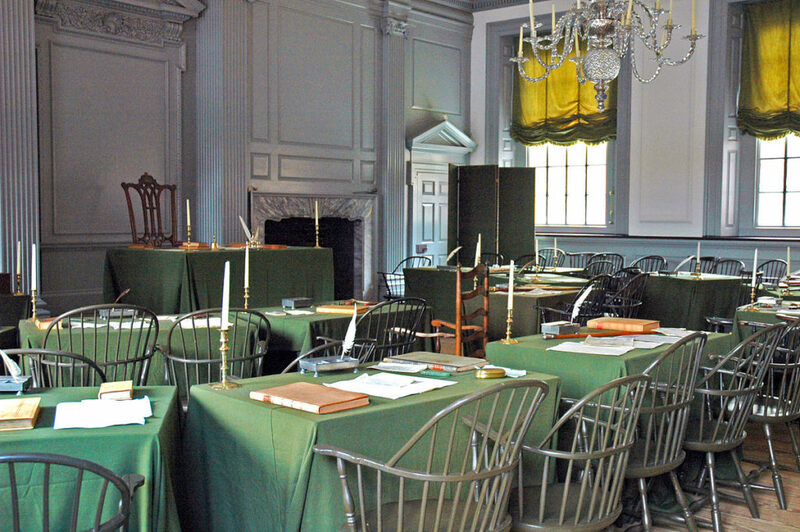 The Assembly Room in Philadelphia’s Independence Hall, where the Second Continental Congress adopted the Declaration of Independence. The room setup resembles the House of Deputies at our General Convention. Independence Day is a major feast according to the calendar of the Episcopal Church. Until I started the Grow Christians blog, I was unaware of this reality. When I discovered it, I found it slightly disturbing. And then I thought again. I was born in 1971. And so I come to participation in American civic life with the recognition that American civic life is deeply flawed, and always has been. When the architects of our republic wrote the magnificent words of the Constitution and the Declaration of Independence, they were signing a promissory note to which every American was to fall heir. This note was a promise that all men, yes, black men as well as white men, would be guaranteed the inalienable rights of life, liberty and the pursuit of happiness. When you learn as a child that your country has been broken from the beginning – not only from speeches but from incontrovertible facts; not only in regards to the rights of black men but also many more – you come to Independence Day with a certain wariness. ‘You have heard that it was said, “You shall love your neighbor and hate your enemy.” But I say to you, Love your enemies and pray for those who persecute you, so that you may be children of your Father in heaven; for he makes his sun rise on the evil and on the good, and sends rain on the righteous and on the unrighteous. For if you love those who love you, what reward do you have? Do not even the tax-collectors do the same? And if you greet only your brothers and sisters, what more are you doing than others? Do not even the Gentiles do the same? Be perfect, therefore, as your heavenly Father is perfect. What does this mean? It means that as disciples of Jesus celebrating Independence Day, we are called to love and pray for the members of ISIS, Al Qaeda and all enemies of America. Writing those words turns my stomach. I feel fear and revulsion when I remember these fellow human beings who cause destruction and terror. But in my baptism I was sealed with the Holy Spirit and marked as Christ’s own forever. And so I trust that over time the grace of God and the practice of faith will settle my stomach as I offer these prayers. I hope so. Fear and revulsion never lead the way to peace. We hold these truths to be self-evident, that all people are created equal, that they are endowed by their Creator with certain unalienable rights, that among these are life, liberty and the pursuit of happiness. That to secure these rights, governments are instituted among people, deriving their just powers from the consent of the governed. The equality of all people before God and the importance of participatory consent to democracy are core values I want to pass on to my children. Along with the sometimes troubled story of our family, I will pass on the troubled history of our nation. But I also want my children to know that the ideals on which our nation was founded are fundamentally strong. What history asks of us is to help our nation grow closer to those ideals, generation by generation. In that effort, I commend to you the new #EpiscopaliansVote resources available here. Although politics also can turn my stomach, as a disciple of Jesus I am called to love my neighbor. That means engaging in politics, the decision-making process by which both my neighbor and I are governed. I am grateful to have a site I can trust to inform me about my elected representatives and the issues we face as a nation. It’s been ninety years that the Episcopal Church has had Independence Day on our calendar of feasts. I am no longer disturbed by this reality; I am grateful. Our church has made me think through my observance in a new way. It is more meaningful, and that matters. We practice faith to challenge us, not just for comfort. What does it mean to you that Independence Day is one of our major feasts? Hello Nurya! We met at the eFormation conference. I’d love to post some excerpts from this blog to our family and kids page for members of St. Matt’s. Since we are Lutheran I’d like to omit portions that refer to the Episcopal church, not because they will be offended but because they will be confused. You have really good words about the flaws and beauty of our nation, I’d like her permission to share some of this. You’re welcome to repost any excerpts you like as long as you include a link to the full post at the Grow Christians site. Thanks!